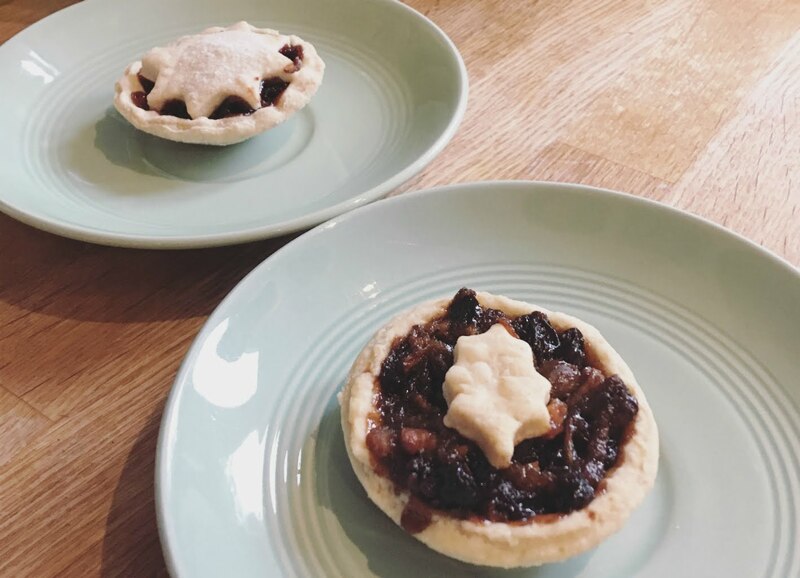 Our final cooking challenge of 2017 was mince pies. It was just me and my mum competing in this one, and we decided to make them ready in time for a group taste test on Christmas day. Pictured above is a sample pie from each of our batches. My mum's is on the left, and mine is on the right. As there were a lot of vegans in the group at Christmas, we both opted for vegan recipes so everyone could taste test both pies. In fact, we both ended up choosing the same recipe - this one from BBC Good Food. Ben and I got the BBC Good Food Vegetarian Christmas magazine and cooked a load of stuff from that over the festive period - it had a great selection of recipes. My mum did really well and followed the recipe pretty closely, whereas I struggled to find any black cherries in kirsch so supplemented for some extra dried fruit and a dash of Christmas pudding flavoured liqueur - that's the same kind of thing, right? I also substituted the hazelnuts for walnuts. I like the star shapes my mum used on her pies - they look much neater than my single holly leaves. For presentation alone, my mum's were definitely the best. When it came to the judging we served everyone up half a pie each (one each would've been too much after our huge Christmas dinner), and did some taste testing. Around the room most people seemed to favour my mum's filling (probably because I tampered with mine) whereas my pastry got the biggest thumbs up, as it was a bit flakier. The scores were quite similar too, with a few sevens and eights. In the end we settled on 8/10 each which seemed pretty fair, although I think my mum should probably get a little higher based on the appearance of her pies. It worked out quite well for me and Ben as we were left with a tin of mince pies to work our way through in the couple of weeks following Christmas. A good snack for the first week back at work. Our next cooking challenge (the first of 2018) is going to be pretzels. Wish us luck!